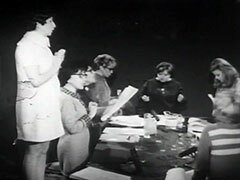 Excerpt from the text of the play entitled Les belles-sœurs (Sisters-in-law) March 4, 1968 at the Apprentis Sorciers theatre along with a commentary by Michel Tremblay and André Brassard, respectively playwright and producer of the play, and an interveiw with actrices Denise Proulx and Denise Filiatrault. [G]: Ohhh, don't speak to me, go away. You're no better than the others. [G]: Go away! Get out of my sight. [a]: But I defended you, I'm on your side Germaine. : [...]|what you don't know is that at the end, during the O Canada, I'm really proud of that. It's very important, it's very important : They came back singing O Canada, Germaine Lauzon gets up, they are triumphant. Germaine Lauzon stands with difficulty, submits herself and sings O Canada. and to reward her, heaven, which is somewhere in the stamps, sends her a rainfall of trading stamps to swamp her. [j]:[...] in this particular case, do you have the impression you are acting if it is as realistic as that? or are you demeaning yourself somewhat? [Denise Filiatrault? ]: no, oh no [...] to demean myself, of course we have the impression we are acting, because I, do not think that I resemble the character of Mrs. Ouellette that I play but I am very familiar with this character for having seen it around me a lot, a lot. The role fit like a glove, but when you are an actress, you can play any role and Denise is a good actress [int]: In your opinion, is it a formula that can continue to be used in the theatre? [Denise]: I believe above all that this with this play, and as I said earlier, itis above all very commercial. It is a commercial play. [j]: So one can now state that a play can be commercial and, at the same time, valid? [Denise]: Absolutely, such is the case with this play. [j]: but the fact of using all these stereotypes, from the funeral parlour to the pregnant girl and all the other stereotypes that we know of in Quebec. Hem, isn't that taking the easy way out in your opinion? It's not broached that way. Hem, the scenes in the funeral parlour are not broached like dramatic sketches, far from that. They are, they are very real.